At INTEC Group, we believe that great design has the power to enhance the human condition. Architecture and interior design are about more than spaces people inhabit. They are about how we interact with one another, how we become inspired to excel and succeed, and how we form the relationships and ideas that could potentially change the world. Great design affects people greatly, and we are passionate about finding new and innovative ways to do just that. Through the years, our passion has come out in our work, the places we’ve designed and the clients with whom we’ve worked side by side. 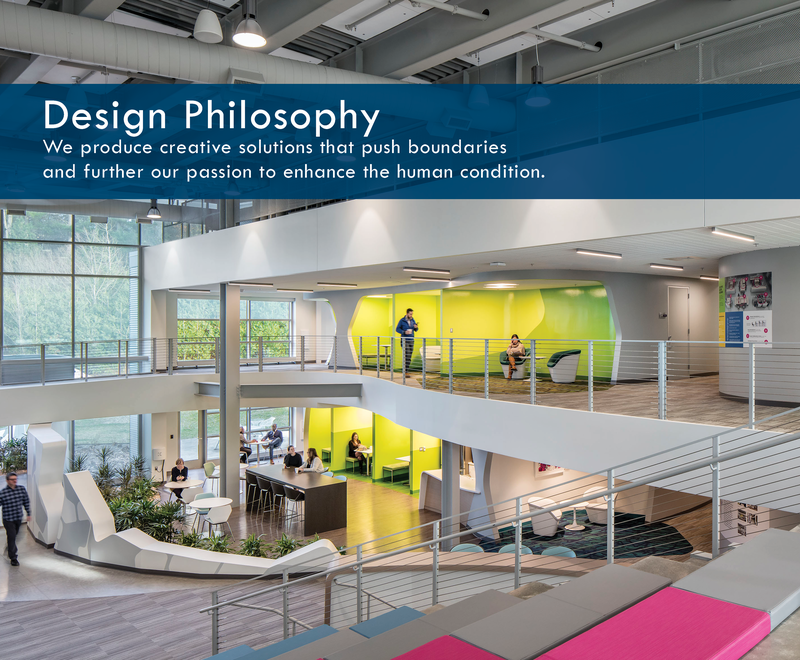 We’ve recently taken a fresh look at our design philosophy and have formally articulated the philosophy and principles that fuel our passion. It is the “Why?” behind what we do as design professionals. The effort to re-define our design philosophy began in early 2017. INTEC team members were surveyed on potential philosophy statements and asked to comment on the particular reasons they agreed or disagreed with each statement. Survey results were tallied and the comments dissected. With group input in hand, our brand team gathered once again to begin crafting what would become our core philosophy. This collaborative process represented a crucial step in re-discovering and defining our philosophy. We pride ourselves on being a people-centric firm of individuals fueled by a shared vision. By infusing each individual’s unique perspective to the overall philosophy, we were able to empower every member of our team. When all voices are valued, not only does our team collectively benefit, but our clients become the beneficiaries of more considered, and more creative work. This exercise in employee engagement culminated in the creation of our design principles. We’re all designers, investing daily by collectively growing our knowledge and resources. As leaders of thought and action we immerse ourselves in what we’re passionate about to create powerful experiences. We believe all people are designers in their own unique way, creating new solutions that enhance the human condition. We believe this to be true for each of our team members and people with whom we collaborate. Here, each person’s passion is represented and encouraged to thrive. It’s often said that good ideas can come from anywhere. That’s why, whenever we work on a project, we welcome all suggestions to help us explore deep within our clients’ brands and to aid us in carrying out their mission. To help you tell your story, we start by listening, observing and asking questions that go beyond standards and aesthetics. We connect the dots to build strong relationships that achieve results for each unique context, uncovering the intangibles and celebrating your culture. Everyone’s story is worth telling. What sets INTEC apart is how willing our entire organization is to listen to each new story that comes our way. Since the beginning of time, storytelling, first graphically, then oral and then written, has been the driving force behind all great change and enduring connections. We tell stories every day, from expressing our own individual passions, or pitching design ideas to a partner, to working alongside our clients in order to fully capture their vision, and finally through the designs we bring to life. Our stories and ability to effectively communicate are vital to strengthening the bond between our company and our clients, which is evident in places we create. By creating breakthroughs through our unique design process, we identify solutions that are impactful and authentic. We can’t help but challenge each creative decision to have purpose and value. Our goal isn’t just to make it different; we help you achieve success by making it better. We are a collection of innovative and creative individuals with the experience, skills and passion needed to create unique, and often groundbreaking, solutions for our clients. By pushing the boundaries of design, we can go beyond the successes of a traditional environment and facilitate spaces that promote better living and work environments. No matter the client or its mission, we’re able and capable to exceed their expectations. We produce creative solutions that push boundaries and further our passion to enhance the human condition. Our philosophy doesn’t simply define what we do. It illuminates who we are, and more importantly why we do what we do. It is both a mission to ourselves and promise to our clients and community. We are excited to begin 2018 by sharing with you the advanced ideal that will stand as the foundation upon which we build our work for years to come.